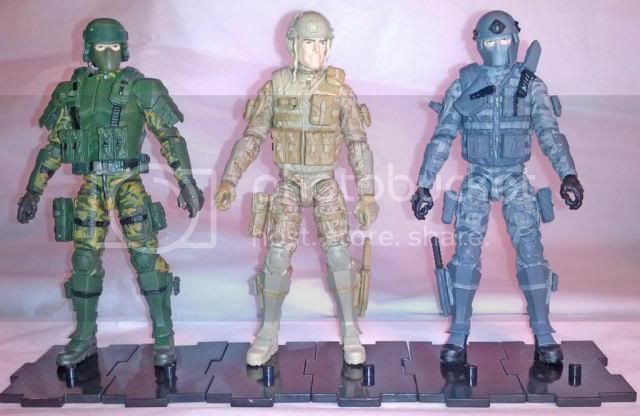 Is there going to be a a way around the shin guards on the lower legs below the knee on these figures? That, or can you swap them out with other 25th/ME figure lower legs? I've been wondering this too. I don't hate the shin guards, exactly, but it's an obvious choice to customize, given the nature of these figures. Shin guards are not exactly common in contemporary warfare, I can tell you that much. Heck, even the knee pads should be customizable, ideally. Soldiers use them quite a bit these days, but often you'll only see one used instead of two. Please check out http://hmcsgreatadventure.com/ - it's a mix of sci-fi, humour and the friggin' Royal Canadian Navy, eh! I would prefer traditional combat boots to the baggy long pant style we've been getting lately, if new lower legs are an option. I can understand the desire to have different options between the three, but I prefer the "combat boot" look as well. That or at least some options to add knife and small gun holsters as well. I'm wondering if these have screw construction, and can be disassembled. I love everything except those shin guards as well. I bet it will be easy for them (not necessarily us) to create new leg combinations and then customize. I will add that they don't look so horrible on the blue Guerrera figure. He is going to sell like Corona on Cinco De Mayo. I can't wait to buy at least 5 and I'm sure others will as well. Not sure about how compatible they are with other Joe legs, but the shin guards are it. Maybe if they do really well that they'll continue on and give us a modern military type. Besides...am I the only one that sees "Colonial Marine" in these.. ? I really like the shins. But it's the futuristic look of these guys that I like the most. It will be cool when MTF can offer different figure construction, but for now I'm happy with these guys. MJ said no screws IIRC. They look futuristic but not so much that they don't fit in with joes. After the FSS, this is the best Joe news we have gotten in a long time. I am hooked!